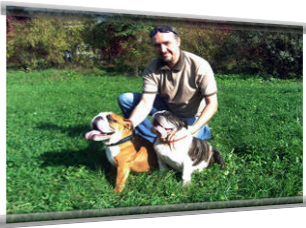 You have seen an English bulldog - and have for ever given it the heart... Behind unapproachable appearance of this brave, resolute dog - the reliable, kind, clever friend improbably betrayed and loving. Its thin sense of humour and ingenuity are capable to kindle the most stale heart. Do not trust those who says, that a bulldog - the slowcoach. She is easily trained dog whom all seizes hurriedly. All depends on the owner.